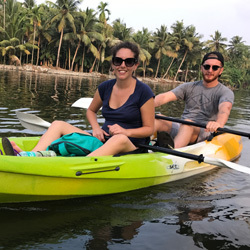 Kayaking is the best way to reach small canal of the backwaters. On an early morning tour you will see the village wake up and come to life. You will observe birds and ducks which we pass by without disturbing, this you can only do in the serenity of a non motorized vessel gliding by. Our sunrise tour started at 7, which is the best time to be out on the water, it's calm and quiet. The tour starts 2km from the city, and we start kayaking immediately from there. After paddling for an hour through the canals we will have breakfast. You have a choice of Indian breakfast or omelets and toast. Please let us know in advance which one you prefer. After breakfast we will paddle through various smaller canals where you see local villages, rice paddy fields, and here and see the bird's life. Here you really get to enjoy the serenity of the backwaters. 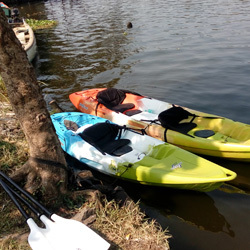 We finish kayaking at a small lake and will return by motor boat back to the base. sunset tour started at 2.30 pm; the tour program is same as like morning cruise. We offer tea with snacks instead of breakfast for the sunset cruise. We offer a 7 hour cruise for those who want to have more time and cover more distance to the water. The morning option includes breakfast and lunch. The afternoon option that stars at 11.30am includes lunch and tea. On our overnight trip you will join the guided morning tour for 4 hour. After that you will be checking into a local village house for your overnight stay. 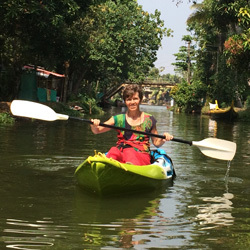 After your lunch there you will spend the afternoon freedom kayaking around the smaller canal in the local village. You will have a real down to earth experience living in a local village house. You will have dinner and breakfast there. In the morning after your breakfast you will catch a ferry back to Alleppey. We conduct special cruise for groups. The time and the cost is negotiable for groups.